More radicchio is becoming available from California each year as North American suppliers seek out year-round supply. Traditionally, radicchio supply - especially to the East Coast - was dominated by imports from Italy. But now, California growers have managed to extend production year-round. "We now have good year-round supply of radicchio heads from California," noted Patrick Ahern of Baldor Specialty Foods. "Typically, there was always a few gaps at times throughout the year, but California growers have done well to bolster production in different regions, including Yuma. In the past, most of the radicchio for the US market came from Italy in sea containers. Gradually, California started showing more and more and now we are at a stage where we have reliable supply from there year-round. Right now, companies like J. Marchini Farms and Royal Rose LLC are some of the biggest distributors on the West Coast." The company is even trialing sourcing from Guatemala to fill times of additional demand. According to Ahern, Baldor used to source radicchio from Guatemala from time to time and is mainly targeted for commercial grade. "We are set to do a trial shipment from Guatemala for the first time in several years," he shared. "It has been done before to supplement supplies so we will see how the response is from these shipments and go from there." Suppliers observe that the market is steady. There has been some variation in past months, but currently prices are good. "The market in general is pretty steady," Ahern said. "It is currently on the high end of the normal range at $13 - $14 here at Hunts Point. Typically, prices hover around $12, but they have been as high as $18." 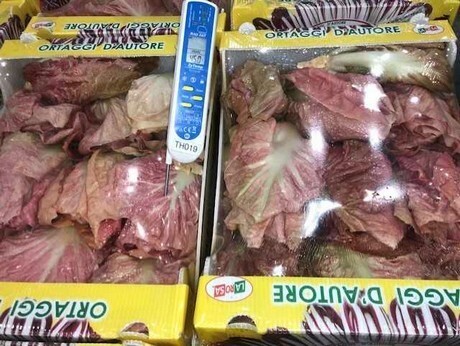 Demand is also good and Ahern explained that the inclusion of radicchio into salad mixes has had an influence in the increasing demand for year-round supply. "Radicchio started to be included in Mesclun salads as a filler and this helped to raise its profile and gain familiarity in the market." Despite California now producing some of the more common radicchio varieties, most of the specialty varieties still come from Italy. 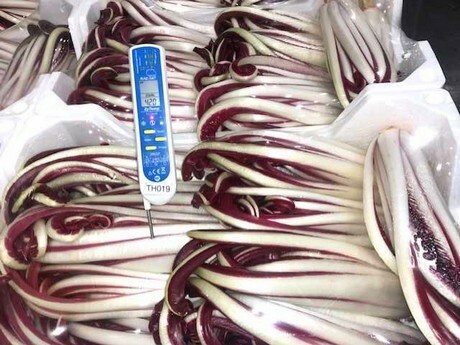 "Baldor sources a number of varieties of the Chicory family such as Castelfranco, Puntarelle, Del Veneto and others directly from and Italy," Ahern said. "It is all shipped by air as a premium product, packed in 1kg or 3kg bulk trays that are wrapped. The biggest demand comes from restaurants but we also sell radicchio to retail stores along the East Coast." Ahern pointed out the Castelfranco for its beautiful coloring and unique taste. "It's really very pretty. It has parchment thin leaves which are pale yellow and speckled with red-pink flecks. It has similarities with Butter lettuce, with a somewhat bitter taste and buttery texture."